Liberty Bell, the first slot machine, from which all slot machines now present in online and land based casinos descend, is the invention of a German mechanic who emigrated and worked in San Francisco, California. 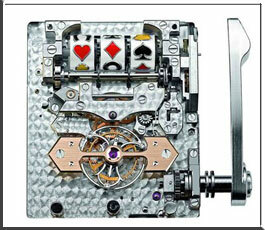 Having 3 reels inside the casing, with 10 symbols on each one, it functioned like any man would imagine a slot machine should work. Each reel had a liberty bell symbol while the other were mostly suits from playing cards. The jackpot was reached when the lever got pulled and all 3 reels showed the same symbol. Just 3 years after they were invented, slot machines games they were banned. Innovative slot owners replaced the coins with gum, drinks or candy and changed the card suits symbols with images of fruit or gum. the gum sticks that are now bar symbols. Until 1970`s casinos slot machine were rather new. Physical changes the machine had suffered limited the odds of winning the jackpot to 1 in 15,624 because the reels had now 25 distinct stops. Top jackpot was even harder to get so that the machines cover the big floor place and enough profit. Later though, a new slot machine that contained electronic parts besides the mechanical ones was invented by the pinball machine corporation named Bally. This way, slot machines started to be more profitable because they had larger hoppers to fit bigger coins and allowed bigger bets. In the 1980`s a new mini computer, named random number generator that simulated the spins became very popular and changed the industry. The new slot machines revolutionized the world of casinos. A computer powered the new virtual reels so they were much larger. A spin button that activated the random number generator (electronic RNG) replaced the lever and a preset percentage was paid by the machines. Today many casinos provide their clients with online casino slots too. The slot machine producers used the new technology to make a large number of fun and attractive games for the slot machines. They are highly enjoyable and gamers seem to find it almost addictive. Nowadays 80% of casinos` floor space and revenues is represented by slot machines.